RetroSuburbia is part manual and part manifesto. The book shows how Australian suburbs can be transformed to become productive and resilient in an energy descent future. It focuses on what can be done by an individual at the household level (rather than community or government levels). RetroSuburbia is a source of inspiration, introducing concepts and outlining patterns and practical solutions. It empowers people to make positive changes in their lives. As with David’s previous work, it is thought provoking and provocative. If you are already on the path of downshifting and living simply, exploring RetroSuburbia will be a confirmation and celebration that you are on the right track and guide you on the next steps forward. If you are just beginning this journey, it provides a guide to the diversity of options and helps work out priorities for action. For people concerned about making ends meet in more challenging times, RetroSuburbia provides a new lens for creatively sidestepping the obstacles. The book outlines options available to retrofitters in three ‘fields’ – the Built, Biological and Behavioural – along with speculation on the future and philosophical musings. Throughout the book, examples from David’s ‘Aussie St’ story and real life case studies support and enhance the main content. RetroSuburbia can be read as a whole, cover to cover, or can be dipped into according to your interests. It is self-published through Melliodora Publishing – in itself an expression of the values and processes espoused in the book. It is directly marketed to the public through the networks that bypass the monopolistic online conglomerates. 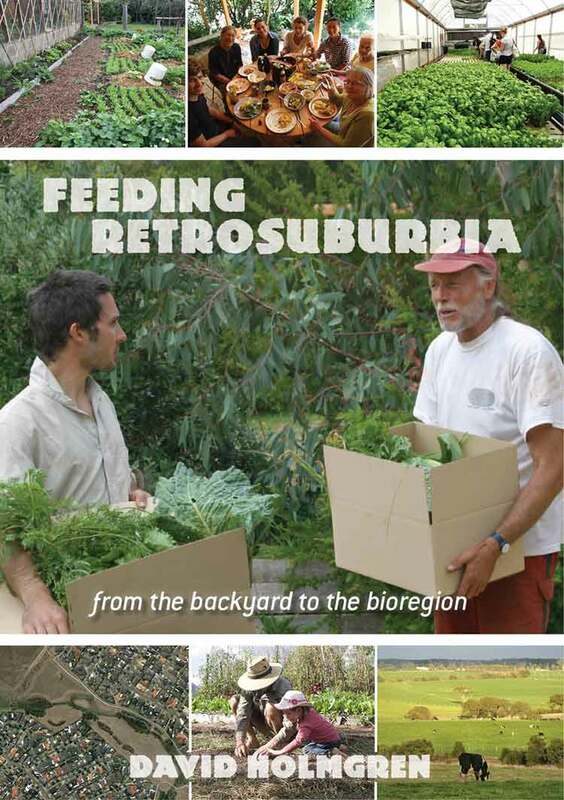 RetroSuburbia is almost 600 pages in full colour with 556 photos and over 100 watercolour illustrations from permaculture illustrator Brenna Quinlan. A heartfelt thank you to our community crowd funding supporters. To get a taste for the book, follow the links below. For those already reading RetroSuburbia, you will find extra resources and the links referred to in the book under each chapter heading. Finding a source of information that can equip an individual to go out into the world and deal with the ever-changing realities around them is difficult. I know firsthand that completing a degree in landscape architecture did not make me a landscape architect. I studied a range of courses concurrently including my first Permaculture Design Course, Catchment Management, Aquaculture, and even life drawing and graphic art. It takes years of experience and the synthesis of countless scenarios to turn a book into a living, breathing, valuable asset for sharing knowledge. And that is what RetroSuburbia is: a massive undertaking that happily holds the hand of those seeking a method, a manual or – could I say – a handbook for living that articulately clarifies and validates the how and why of a community-conscious approach to life. We are creatures of habit. Stand in the path of a friend, colleague, family member or total stranger in need of their morning coffee and you will know exactly what I mean. We humans, as a general rule, don’t like change. We may talk up the exact opposite but it’s just that, talk. Habit is a formula from familiarity, which over time develops into what we call ‘culture’. Culture is what we know, who we are and how we live, so if you mess with it or try to change it, you are disturbing something that runs deep. It’s like tampering with an iceberg. David Holmgren is no stranger to messing with the status quo. 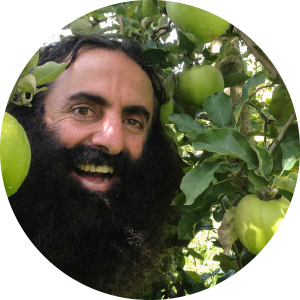 As co-originator of the permaculture concept, David has pushed the parcel, rattled the cage, and tinkered with the comfort zone of us humans and our settlements from the top down and the bottom up. How do we live, work, and sustain an ever-growing population on a finite planet? You don’t ask any bigger questions than this. For over four decades David has been exploring better ways to feed and house the human population peacefully, sustainably, and regeneratively. Even with these successes, and the positive inroads to changing the habits that create so much damage and destruction to our planet, these habits continue in certain sectors of society. It is out of this stalemate of experience that comes RetroSuburbia. In RetroSuburbia, David’s capacity to dissect and understand the big picture is taken to the most familiar daily habit we all share: going home. This is the very heart of everyone’s day-to-day: their house, their place, their people, their family, their community. What better place to propagate a new manifesto of change than the very collective home of the communities we populate, suburbia? Like it or not, most of us have suburbia of some shape or form in our DNA. So as a starting point, suburbia is screaming out as the place to infect change. RetroSuburbia focuses on how we can do the day-to-day better, in our kitchens, our bathrooms, our bedrooms, our garages, our backyards, our rooftops, our gardens, our pantries, our cupboards. If keeping up with the Jones’ created decades of consumption-based culture, then RetroSuburbia is a chance to change, with proven patterns illustrating how individuals, and communities, can reinvent a way of living. Current case studies make it real, showing how people in everyday houses like yours are retrofitting their homes and redesigning their gardens in inspiring and easily achievable ways. As you recognise the glue that holds these interconnected methods of living together, your lens on the world will never be the same again. David Holmgren makes for the perfect guide and chaperone for everyone from the informed and motivated sustainability zealot right through to the unsuspecting novice ready to change. From understanding how the sun influences your block, to planning for managing your family elders as their needs increase, at every turn the practical and holistic tips are like sunglasses that filter the business as usual (‘this is how we have always done it, mate’) approach. They allow the reader to discover that our fear of change is the only limit to our ability to throw a life vest to life itself. Not as a fad, or a new trend, or a recipe that is doing the rounds of the latest blogs and websites, but a passport to self-reliance that can evolve into a livelihood of do-it-yourself resilience. Don’t be afraid to throw open RetroSuburbia on any page at any time and dive into the possible by recalibrating your thoughts on a particular topic and seeing how your gut processes it for a week or two. This book is a dance, a tango between our habits and our actions, our visions and our intentions. RetroSuburbia boldly renovates what we know as our safety net and replaces it with an action plan; planning for the worst and hoping for the best. The answers are in the everyday. Home is where the heart is. Let the transformation and retrofit begin. RetrosSuburbia is part manual and part manifesto. It promotes the idea that Australian suburbs can be transformed to become productive and resilient into uncertain futures. It focuses on what can be done by individuals at the household level (rather than community or government levels). The context for that interview was The End of Suburbia3 the first popular documentary about peak oil in which advocates of denser cities argued against ongoing suburban sprawl. This documentary reminded me of friendly debates with colleagues in the early 1980s, in which I argued that the critical strategy for a benign future was a permaculture retrofit and re-ruralisation of suburbia, rather than rebuilding our cities at higher densities to reduce car dependence. I started to develop Aussie St as part of my ‘Retrofitting the suburbs’ presentation in 2005.4 This story, told in the second chapter of the book, illustrates the changes in a suburban street since the 1950s, and the subsequent retrofitting of houses and lifestyles to reflect a changing world. An article based on that presentation was published in the CSIRO Sustainability Network Newsletter,5 as interest in backyard food growing, chooks and household self-reliance grew. A presentation in Western Australia, as part of a 2006 joint speaking tour with American peak oil educator Richard Heinberg, illustrated the very different responses my work was generating. The event was opened by the then state Minister for Energy Alannah MacTiernan, who stayed for both presentations. Professor Peter Newman – a prominent lifelong proponent of improved sustainability and liveable cities – attended and later criticised my work as a justification for continued urban sprawl and a relishing of the collapse of complex city functions.6 However, Aussie St inspired another person in the audience, Shani Graham, to start the Hulbert St community initiative in Fremantle7 one of the most inspirational examples of bottom-up, household, street and local community responses to the climate change and peak oil. My Aussie St narrative continued to grow and morph with each presentation, developing a life of its own with names for the residents, and in 2012 I added a near-future scenario ‘The 2020 Second Great Depression’.8 This reflected my growing understanding of how bubble economics could act as a catalyst to precipitate economic contraction as the first stage in a much longer and slower energy descent process driven by peak oil and climate change. The Global Financial Crisis (GFC) of 2008 provided an early warning for an Australia still riding high on the resources boom. Nicole Foss’s writings at theoildrum.com and later at theautomaticearth.com strongly influenced my thinking as I shifted my lifelong focus from the energetic and ecological basis of human systems to understanding the role of money and finance. In Future Scenarios workshops I focused on geopolitical-driven oil price shock, climate change driven-natural disaster and property bubble collapse as potential triggers for energy descent futures.9 These workshops generated empowering insights: the same household and community level strategies that reflected permaculture ethics and design principles would likely be beneficial in all these situations. Samuel Alexander from the Simplicity Institute in Melbourne invited me to write an essay about ‘Retrofitting Suburbia’.10 It was written for environmental and community activists, urban planners and policy people and included a meta-analysis of Aussie St to better explain some of the counter-intuitive aspects to the urban densification debate. I thought it was a stepping stone on the way to completing my languishing book on retrofitting suburbia. 1. An extract of the original video interview is available at retrosuburbia.com/book/preface-1. 2. Although I had already articulated these ideas whilst teaching Permaculture Design Courses (PDCs). 3. Written and directed by Gregory Greene, 2004; see also endofsuburbia.com. 4. First presented with Aussie St at the Aldinga Eco-Arts Village in South Australia. 5. Holmgren (2013) ‘Retrofitting the suburbs for sustainability’ available from holmgren.com.au or retrosuburbia.com/book/preface-5. 6. Newman does nevertheless promote many of the same initiatives that I suggest for building urban resilience for energy constrained futures; see Newman (2009). 7. See Graham’s TedXPerth talk ‘Take a Street and Build a Community’ (2013); see also ‘On Hulbert St’ at ecoburbia.com.au or retrosuburbia.com/book/preface-7. 9. See ‘Futures framework for retrosuburbia’ (retrosuburbia.com/reading). 10. An updated version, ‘Retrosuburbia; the manifesto’, is at available at retrosuburbia.com/reading. 12. For an extended version of the story the genesis of this book, see ‘A short personal and global history of retrofitting the suburbs’ at retrosuburbia.com/reading. The purpose of this book is to help those planning or engaged in a retrofit of their homes, gardens and lifestyles to be more self-reliant and resilient within the household and local neighbourhood. This promises both a more fulfilling life and multiple benefits for society and the environment. You can use the strategies, design solutions and complementary options in this book as patterns (or templates) to make incremental and ongoing changes to life in low-density detached suburban housing in our cities, regional centres and small towns.